How many small spaces furnishing rules can you think of? At least five for sure – light tones, fewer or transparent pieces of furniture, fine curtains, simple lines… we can go on. But sometimes rules are made to be broken. Just as interior designer Nicca Sarmiento has done, by furnishing a 35 m2 living area directly opposing the above mentioned rules. 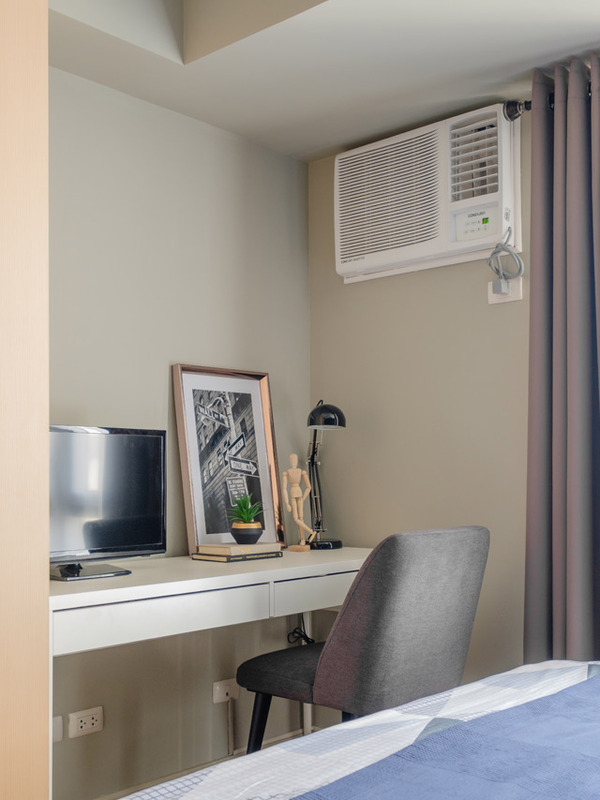 It is the home of a young man with a good career who is striving for coziness, comfort and the atmosphere of a fancy hotel. 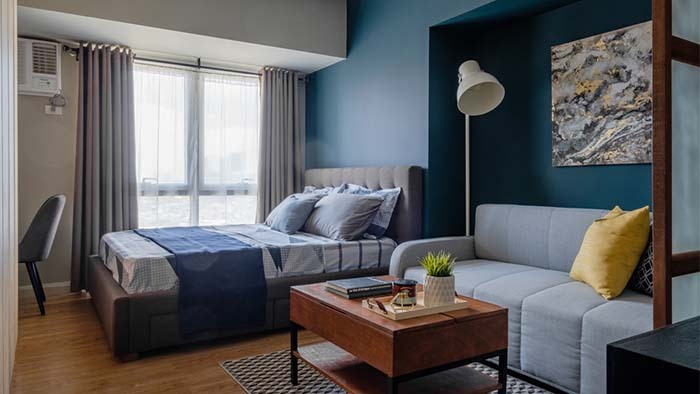 After meeting him a few times, Nicca presented her concept of a modern urban apartment, combining contemporary, industrial and organic modern ideas. 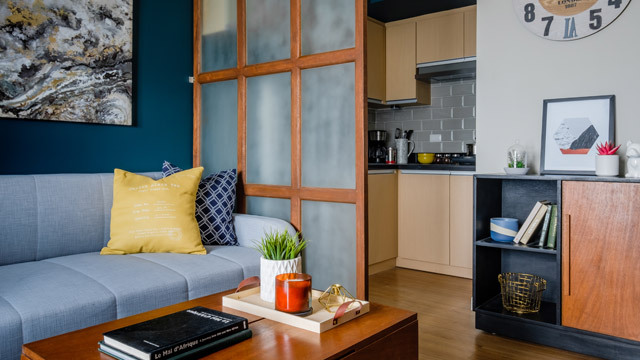 The style draws inspiration from the fast-paced urbanized lifestyle, its main goal being the creation of a relaxing home environment, but doing so by using a bold color palette, something not typically associated with small flats. Similar to most apartments, the studio has a small hallway, which leads to the common areas. Nicca added wonderful storage solutions to maximize the available space. 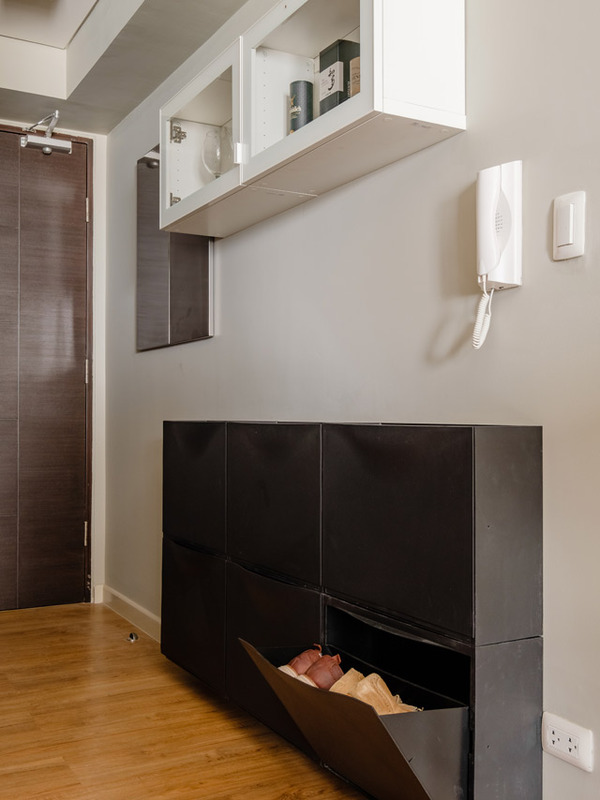 The shoe cabinet in the wall is a good choice, as it enables the owner to store shoes at hand’s reach. She chose a hanging cabinet with glass doors for additional accessories. The designer worked with a soft shade of gray as a dominant color. It adds good contrast to the surprising dark accent wall, which complements the space. From there you can see the lighting she chose for the living room – a four luminaires spot, which all point to different directions in order to illuminate the whole space. Surprise! 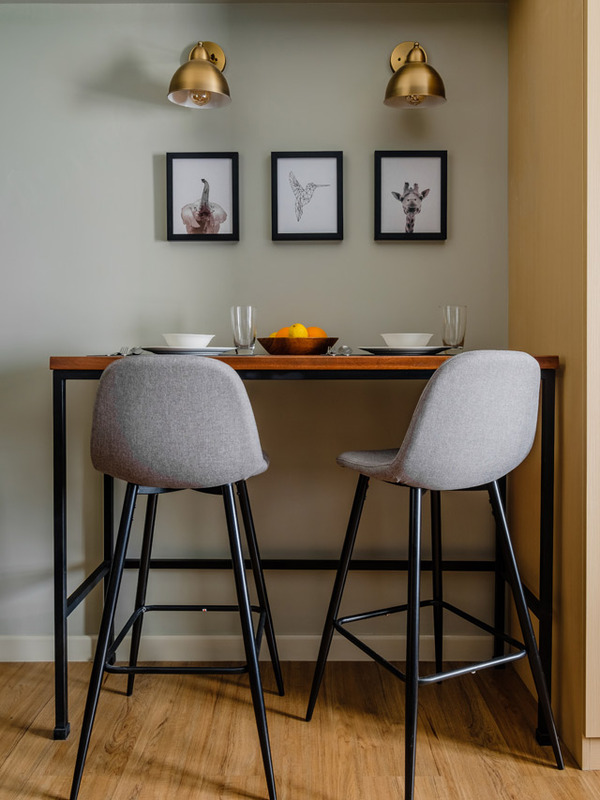 The dark accent wall extends to reach here as well, and becomes a pattern for the apartment. Indeed the bold color creates a distinct atmosphere, Nicca explains. For a balanced look she uses furniture and accessories in brighter shades. In the day area there is a sofa bed, which allows the owner to accommodate guests for the night. 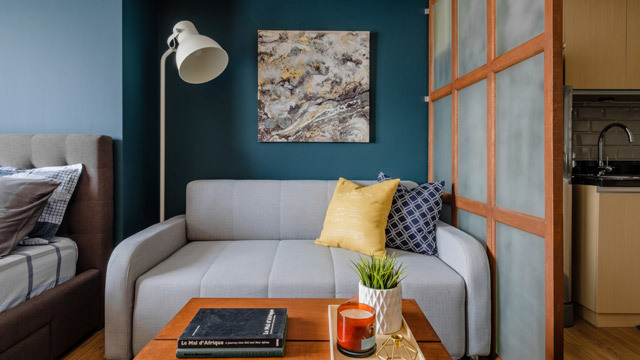 The host would like to keep the walls plain, but to evade dullness, Nicca chose a simple painting to serve the purpose of a focal point of the living area. “I decided to hang a square work instead of a rectangular one. To add depth I used geometrical patterns and lines. They give masculine feel to the space,” she states. 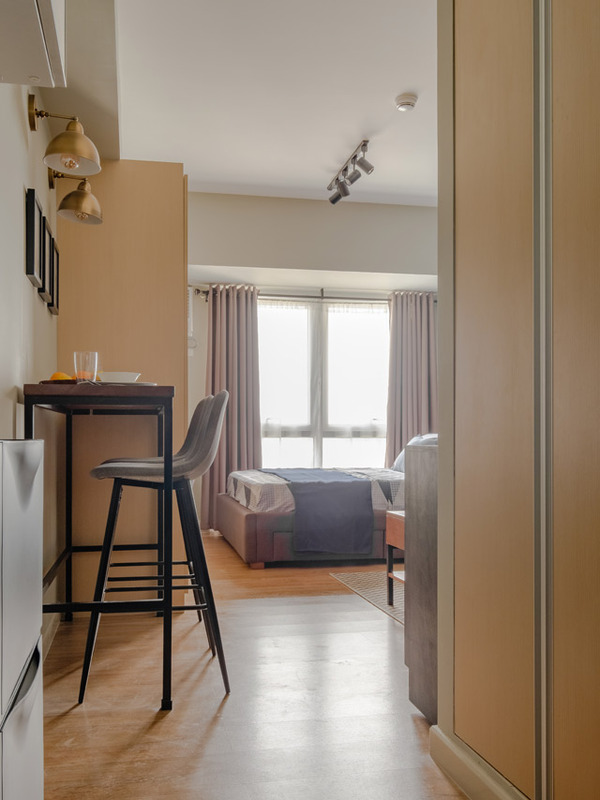 Compact, but with enough room to store things, the kitchen is open-plan and is connected to the living room and the bedroom. Worried about the cooking heat and smell taking over the whole flat, the owner insisted on a closed kitchen at first. To solve that challenge, Nicca placed a ground glass screen to separate the kitchen from the rest of the flat. Next to the wall there is a short cabinet with wheels, which serves as a serving table or an additional kitchen top. 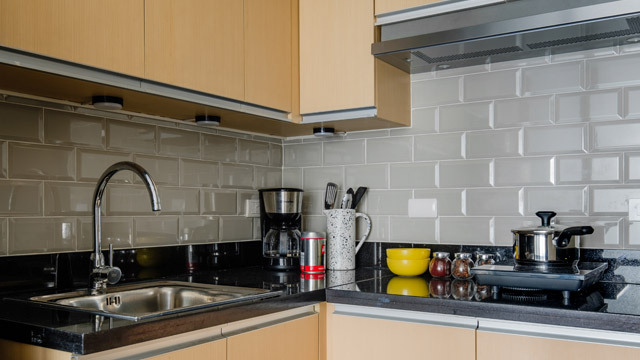 The gray metro tiles are used at the back to help match the cooking zone with the rest of the space. “The kitchen countertop is also small, with little surface to work on, so the challenge was to find a similar material, as the client didn’t want to ruin the preexisting countertop,” Nicca said. Given the plot size, it only contains a handful of basics, including some small utilities. There was no other option, but placing the sink in the corner. The eating corner solution is fairly uncommon and based on the idea to preserve the large wardrobe. Nicca placed a small countertop with two bar stools at the edge of the entry room. Nice wall lamps and works of art round out the look and add coziness. Moreover, this way entering the apartment doesn’t have guests facing the side of a wardrobe. 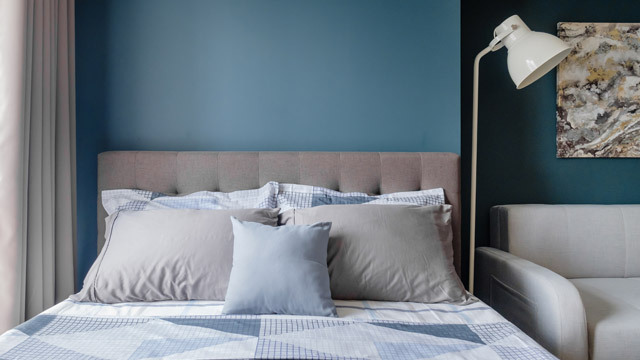 An upholstered bed with a cool headboard makes this part of the flat so cozy. The designer adhered to the dark color, which complements the wall here as well. To introduce more softness, she chose some light long floor lamps. The space next to the bed serves the function of a working area, supplemented by a slim table and an upholstered chair. 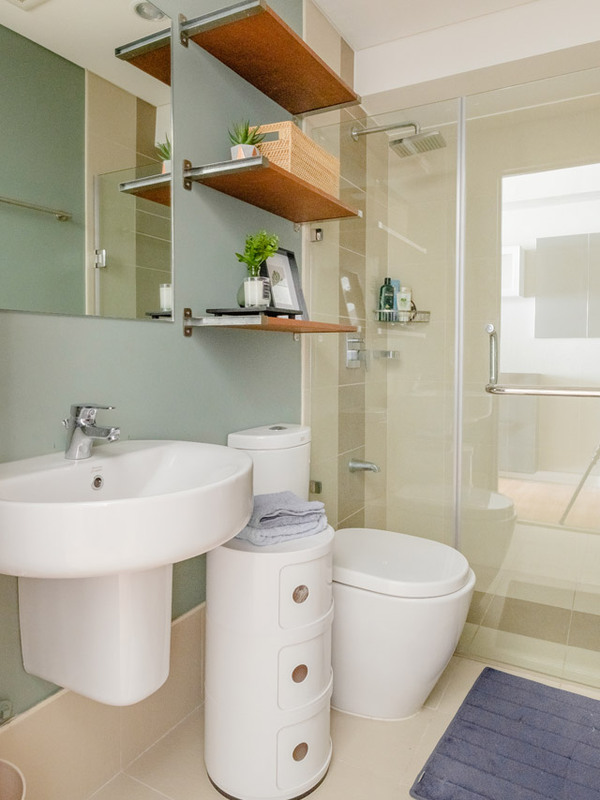 Plain and simple – the bathroom has an enclosed shower area with wooden shelves, mounted on the wall with stainless steel brackets, as additional storage space. A small wooden cabinet is used to place towels and more toiletries.